If you are just getting started in Broadband-Hamnet, I recommend you start out by purchasing a Ubiquiti NanoStationM2 as your first node. I do not recommend starting out with a Linksys WRT54G series. Broadband-Hamnet has undergone a lot of growth over the last couple years. We now have another option in hardware vendors. We have the ability to use multiple frequency bands and even to link them together using Device to Device linking. We have more choices than ever. When I first started in what was then known as HSMM-Mesh, now known as Broadband-Hamnet, the WRT54G series was the only hardware we had. It served its purpose, we were able to create some nodes, install them in locations that allowed for direct line of sight access and we were able to create some functional networks. The problem was the WRT54G was never designed to be used in this type of application. In order to use them in an outdoor location, it had to be mounted in a weatherproof enclosure. The stock antennas were intended to be used to provide links within a home. The stock antennas were not intended to be used for long range connections. Installing a high gain antenna on the WRT54G required coax to connect the two. The cable losses at 2.4 GHz required large diameter cables (at least LMR-400) and short cable runs. All this adds up to extra costs and complicates the building of a working node for us. The addition of Ubiquiti gear to the Broadband-Hamnet line up has brought with it significant improvement in our mesh networks. The installation has been simplified, the cost has been reduced and performance is significantly improved. I can purchase a NanoStationM2 for $90. I add an Ethernet cable to connect the NanoStation to the inside the house for another $20. An 802.1Q capable Ethernet switch duplicates all the ports on a WRT54 and costs around $50. For $160 I have a complete setup with the NanoStation vs $240 for a working node with a Linksys. Even if you have a Linksys node given to you, you will still need to spend $190 to have it ready to set up in an outdoor environment. In addition to the cost savings, a NanoStation has a much better receiver. My experience tells me I see about 10 dB more sensitivity on the UBNT devices. Combining this with the additional 9dB of gain on the transmit side, I have a large performance increase. I have seen NanoStations connect in places where a Linksys device with any antenna we tried failed. The NanoStation works that much better. It is easy to install and it works. I have personally used two NanoStations to create a link of 13 miles. The link worked as was usable. Why did I pick the NanoStation instead of some other Ubiquiti device? When I first learned about the Ubiquiti hardware, I thought the BulletM2HP would be the device I would use the most and that I really didn’t need to worry too much about the rest of the lineup. I was selected to help with the beta testing of the first Ubiquiti firmware. I was asked to test a selection of devices and to be able to validate more of the product line. I started out with a couple BulletM2HP’s, two NanoStationM2’s, a RocketM2, and two AirGridM2’s. I assumed the AirGrid would be my favorite device based on my experience with the WRT54 and the 24 dB grid antennas. At the time, I was sure the NanoStation was not going to work very well. I have a friend of mine has a workshop 13 miles and a nearly perfect line-of-sight from my QTH. This link has become our “test range” when we want to evaluate new hardware. We tried several different combinations of devices and what we found surprised us. A NanoStation would connect with a NanoStation at 13 miles. An AirGrid would not see a NanoStation, but a NanoStation would see the AirGrid. AirGrid to Airgrid performance was not as good as NanoStation to NanoStation. 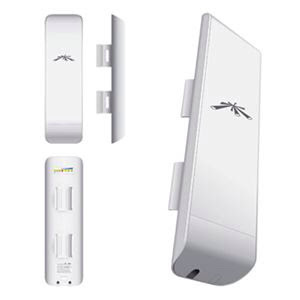 The RocketM2 when combined with a sector antenna from Ubiquiti was able to cover a 120° sector with the same signal strength a WRT54G was able to supply a 10° sector with a grid antenna. It quickly became obvious that for a major node supporting multiple locations to use Rockets with Sector Antennas, and that the NanoStation was the device of choice for a node that connected to one of the major nodes. For general purpose use, the NanoStation became my favorite device. When setting up a new node, I will have to have a specific reason to start with another device besides the NanoStation. These devices fall into the category of MIMO devices. MIMO stands for multiple input multiple output. My experience is the MIMO devices will significantly outperform a single string device. Incidentally, the Bullet and the AirGrid that I thought were going to be my favorites became my least favorites. Flat out they did not work as well as the MIMO devices. The Bullet has its place. I will use them to replace a Linksys when I do not want to replace the antenna as well. The AirGrid works for shorter distance directional links. I do have both devices in use on my network. The Bullet and the AirGrid will also significantly outperform a Linksys box. This is due to the improved receiver and the more powerful transmitter. The Linksys WRT54GL is still in production. It is however, showing its age. Many of the issues we have seen in the forums with the WRT54’s are the result of the older hardware found in these devices. The underlying software that BBHN runs on is OpenWRT. OpenWRT has stopped supporting the WRT54G. There is not enough memory on the WRT54GL to load the current version of OpenWRT. As a result, the current BBHN software for the Linksys products is based on an older version of OpenWRT. There are a lot of features found on the UBNT nodes that cannot be duplicated on the Linksys nodes. This is due to the limited amount of memory and the limitations of the older operating system not supporting those features. I fully expect the BBHN team to stop supporting the Linksys WRT54 in the near term. I cringe when I see a person starting into BBHN with a WRT54. You will save yourself a lot of time and money by starting with the NanoStationM2. It will perform a whole lot better. If you need to tie it into the internet and have Lan Ports you will need to add a 802.1Q Switch but that is all you need to add to have it working. But where do you tell a newbie to find NSM2 XM models? Everything new is going to be XW models, which, at least on the AREDN project, aren't yet supported. At least both of the NSM5 models (XM & XW) are supported, so it doesn't matter which one you get. And finding out from a vendor what model it is isn't really possible unless they're willing to fire it up and check.